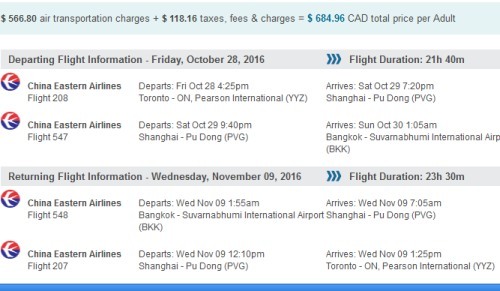 China Eastern is showing some pretty amazing prices from Toronto to various destinations in SE Asia in October and November 2016. The flights have one stop in Shanghai, China each way. The flights to Phuket, Thailand stand out the most to me. 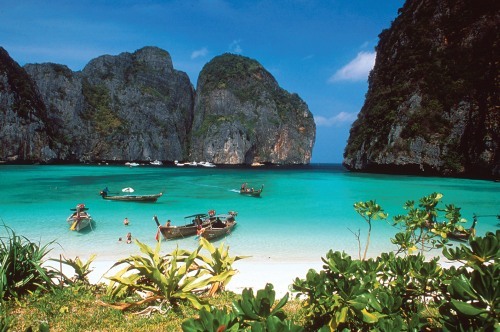 It always costs more to get to Phuket than to Bangkok, and at $655 CAD roundtrip, it's about 50% below the typical best price between Toronto and Phuket. At the moment, it's actually cheaper to get to Thailand and Singapore from Toronto than it is from Vancouver (Canada's gateway to Asia) - which is highly unusual. 2. Click on the departure date box to open up the calendar view. Browse for cheap flights between October and November 2016.
is also showing these for about $29 more. You can also try clicking through from Google Flights to Flight Network if the option is available. Once you get to Flight Network, you can bring the price down another $10 with a promo code (see below). The price may work out to around $20 more than what you see on Momondo. Use the same start and end dates as the regular roundtrip dates you found on Google Flights. Update 8/24 - Cheap flights from Toronto to the Philippines, Vietnam, Thailand and Hong Kong are now available for $696 to $712 CAD roundtrip including taxes for travel in January, February, March, April, May, and June 2017. 2. Click on the departure date box to open up the calendar view. Browse for cheap flights between January and June 2017. 5. Click through from Momondo to whichever booking site is showing the cheap price. At the moment, it appears to be FlightHub that is cheapest. is also showing these for about $23 more. 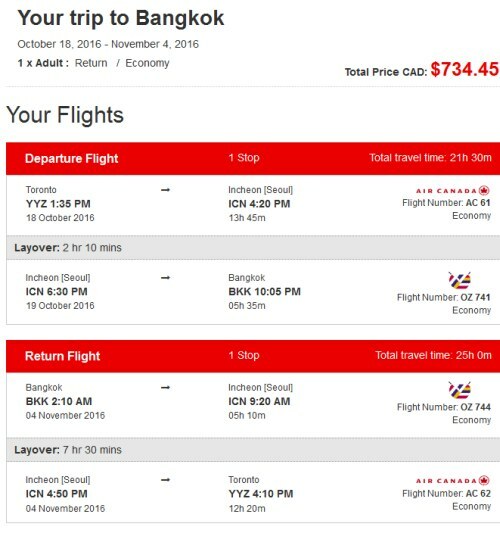 Update 9/7 - There are a few 1-stop flights available from Toronto to Bangkok, Thailand for $634 CAD roundtrip including taxes that use Air Canada for the overseas leg of the journey instead of China Eastern. The tough part is finding dates with 1 stop and decent layover times for a cheap price. The price should show up as $734 CAD roundtrip on Flight Centre. However, Flight Centre is currently offering a promotion for $100 CAD off of any roundtrip flight from Toronto to anywhere in Asia, when using one of the following airlines. toronto, yyz, flight deals, bangkok, thailand, asia, southeast asia, east asia, singapore, sin, manila, philippines, mnl, hong kong, hkg, bkk, china eastern airlines, ho chi minh city, saigon, vietnam, sgn, phuket and hkt. 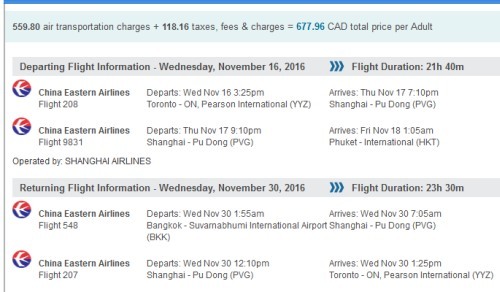 4 Responses to "Toronto to Thailand, Singapore, Vietnam, Philippines - $642 to $671 CAD roundtrip including taxes"
Has anyone tried this for open jaw flights with these destinations? E.g. 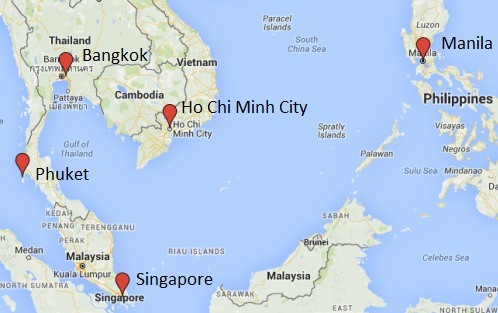 Toronto > Bangkok Ho Chi Minh > Toronto? Good prices. Be aware that China eastern has poor customer service, see skytrax rating. Christy: Yep, that works too. 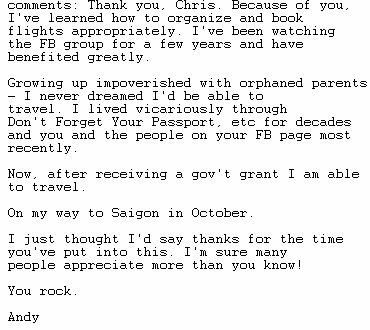 See the bottom of the blog post for details on how to search for flights into one city, and home from a different city.